I have to admit that I have never been into sandbox games, or strategy games, or other games where you just kind of click places and plan for stuff. Generally, I like games where you are doing things, and I’ll say that I really enjoyed the opening to JCB Pioneer Mars. Maybe its because I’ve always like when science fiction meets near science fact. I have no idea if we will ever make it to Mars, but I can’t help but feel it will be a lot like JCB Pioneer Mars. There’s something really romantic about the red planet, kind of like a real-life Tatooine or Dune. 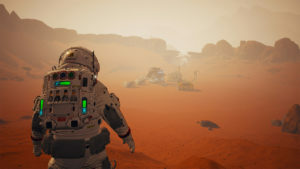 I would imagine that we would have to pack heavy for a trip like that, and it would be very interesting to see what the plan would be for the astronauts in order to colonize the red planet. I really enjoyed the beginning of this game, as I went from place to place seeking to repair vessels, and mining for stuff. In short, when the game was telling me what to do, I was having a good time. There comes a time in the game when it stops telling me what to do. At that point in time, I believe I was supposed to develop my colony on my own. So then what, is there a base to build, or something? Well, I had playing the game for a few hours, so I might as well give it a 7.2. If you do like these sandbox building games, it will be higher for you, and I wanted to make certain I gave it appropriate kudos for the look of JCB Pioneer Mars.